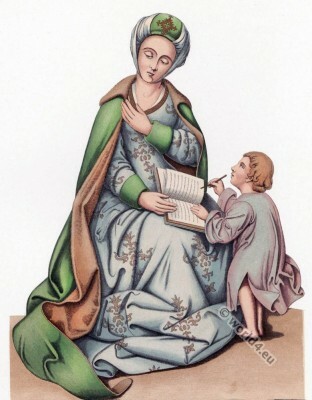 Late 15th century gothic costumes 1460 – 1500. Middle ages, Gothic fashion era. A Woman Costume from the late 15th century, after a painting of the Dutch school, at the Städel Museum in Frankfurt am Main. This figure is undoubtedly a portrait; the whole section of her costume, fully consistent with the fashion, which had developed in the late 15th century in the Netherlands and in France. The turban-like headgear was widespread in these countries, in Germany rather rare. 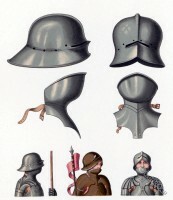 Source: Costumes, art and utensils from the early Middle Ages until the end of the eighteenth century, after simultaneous originals of Dr. J. H. Hefner-Alteneck. Publisher of Heinrich Keller. Frankfurt a. M. 1879-1889. 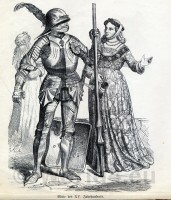 German Knight in Armor, 15th century. 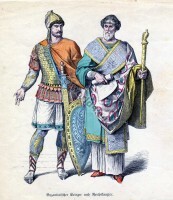 Byzantine Knight and Chancellor costumes. The Nibelungenlied. Kriemhild at Siegfried's Bier. The tapestry of St. Germain l’Auxerrois. This entry was posted in 1490, 15th Century, Burgundian dress, Child, Dutch, Middle Ages, Netherlands and tagged Burgundian fashion period, Costumes art and utensils, Gothic costumes, Medieval costume on 10/25/15 by world4.